Cameron-Price factory - The live production status is shown on a big flat screen. Mass production at Cameron-Price - managed seamlessly using live production data integrated with its ERP-system - the Blackbird easy IoT solution. One of the biggest manufacturers of automotive parts based in the United Kingdom is using the easy IoT solution - Factbird and Blackbird cloud service, to integrate real-time production data and their ERP-system. 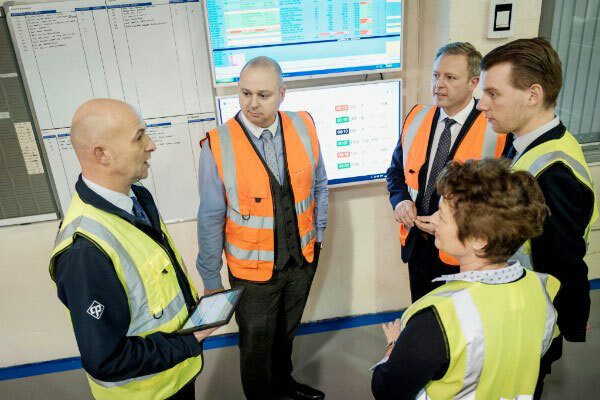 Cameron-Price can now manage its factory of more than 40 machines and assembly stations more efficiently with real-time data rather than just a “gut feel”. Cameron-Price has been an industry leader primarily in the automotive sector for almost 60 years and knows how to combine their knowledge and experience to serve their key customers in a very demanding and competitive industry. Their core business is manufacturing plastic injection moulded components for customers across the automotive, industrial and FMCG (Fast-Moving Consumer Goods) sectors. Cameron-Price is an international company currently servicing 15 countries around the globe and is continually expanding their business, not only within the automotive industry, but also within the medical and electrical industries. Performance meeting at Cameron-Price’s shop floor with the real time production data on Blackbird cloud application. Cameron-Price is constantly looking to invest in new technologies, that allows the company to deliver first class mouldings and that establishes a real-time, fully traceable service. In its search for new and innovative production solutions, Cameron-Price came across the Blackbird solution and contacted the Blackbird team in March 2017 to learn more about the system and its capabilities. The first step towards their collaboration with the Blackbird team was to evaluate the benefits of access to live data in the production of their injection moulding machines and assembly stations. To this end, Blackbird supplied Cameron-Price with the Factbird - Blackbird's Plug and Play solution for production data collection/analysis, and Cameron-Price installed it easily in their production process. The ease of the Plug and Play capability of the Factbird system enables its seamless implementation during production without any interruption. Cameron-Price simply added one line after the other in a stepwise approach that they could fit into a busy production schedule without the need for any external support. After installation of the Factbird system, the Blackbird team developed a custom development project that now enables Cameron-Price to follow the live production status of more than 40 of their moulding and assembly lines on the Factory Overview dashboard on the Blackbird application. During the course of this customization, the Blackbird team realized that Cameron-Price had a Navision based ERP-system, but with no connection to the production data. This finding was swiftly remedied by the Blackbird team, consequent to which the production schedule data of Cameron-Price is now automatically sent to the Blackbird system, thus cutting down a significant amount of manual work while also improving data accuracy. Factbird sends the production data directly to the Blackbird cloud server. The next step was to add a number of Factbird Views – Blackbird’s variation of the Factbird with a video option, which connects to a camera to visually identify errors in the assembly stations. The Factbird View can detect variations in the production and exhibit the associated video so as to easily trace abnormal situations and identify their causes. Therefore, the video data becomes very useful to improve the yield of the production, enabling Cameron-Price to meet the high demand of the various industries in which they operate. Staying competitive in an industry requires one to have the courage to make changes and innovate. Cameron-Price showed us that having a strong management initiative can make anything possible. Introducing a new technology like Blackbird earlier than its competitors has enabled Cameron-Price to successfully pursue continuous improvement in quality, productivity and service, and stay competitive in the global market.